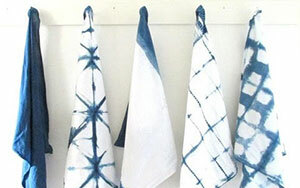 In this fun and easy class students will create a set of four hand dyed indigo Shibori napkins! Transform blank white cloth napkins into one-of-a-kind works of art by creating patterns with different stitch resist and folding techniques. Bring your art smocks because we will be hand dyeing our napkins with indigo dyes. You will walk away with a set of four beautiful and unique indigo napkins sure to pop at your next dinner party. Come enjoy this relaxing class and experiment with new creative processes that can easily be replicated at home! Recommended for ages 13 to adult. All supplies included with a $25 materials fee, payable to the instructor on the first day of class.